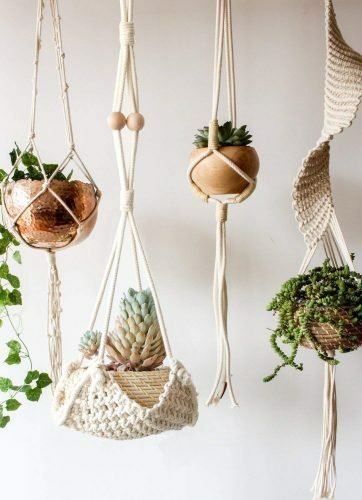 Can you remember the macramé trend of yesteryear? Guess what they have made their return from the peace-and-love era. 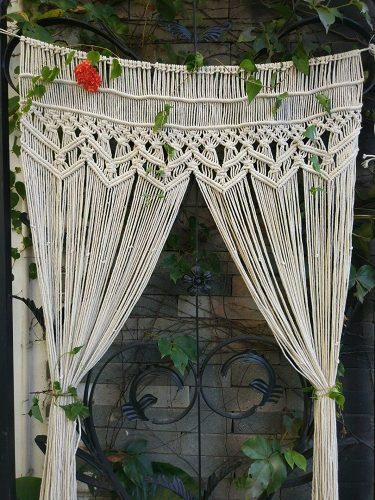 There are different forms of macramé available with clever ways to use them. So if you have a space in the home one of the top 10 best macramé wall hangings available with us is sure to fill up the room. Whether you want to add some flair or need a gorgeous backdrop, you can find the best ones available here. Do you have some open space alongside your mirror in the home? 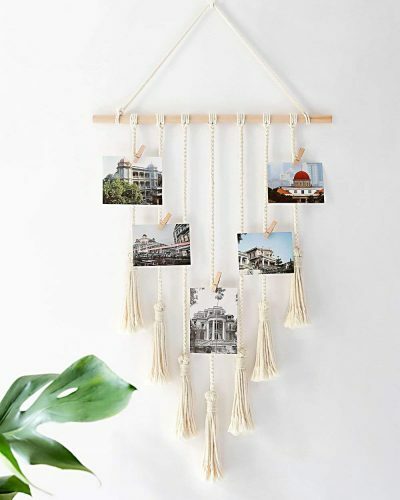 Pick the Mkono hanging display picture macramé organizer to fill up space. The display will add a casual yet artistic touch to your prints and photos. You can use it as a simple wall hanger to decorate the office or your living space. The material is a cotton cord with a wood dowel and includes 25 removable wood clips. The fabric is eco-friendly and great for indoor use. The wall hanging even makes a perfect gift and has an Ivory color. The width is 17-inches, and it has a length of 27-inches. The Macramé tapestry wall hanging has an attractive price and design. You can drape it over an ugly fuse box in the kitchen and is still in vogue. The size is perfect and offers you a neutral wall covering. The fabric is a natural cotton cord and comprises bamboo dowel. The wall covering has an inspiring ethnic art design and handcrafted to perfection. The product has a flag shape pattern. 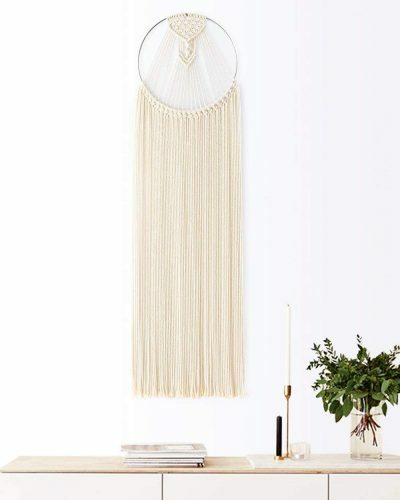 For a modern touch to fill up space above your bed, you need the Mkono macramé dream catcher. The design is elegant and handcrafted with a bohemian pattern. You can hang it anywhere in the home or office. The construction is cotton cord and has a metal ring for hanging. So add some bohemian vibe to your bedroom and keep those horrible dreams out. For an excellent macramé wall hanging, the Mkono wall mirror comes included with the macramé covering. 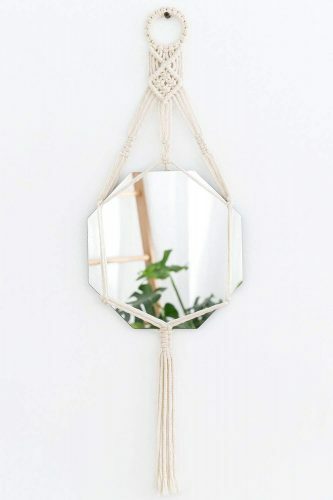 The octagonal mirror looks perfect on any wall and looks fantastic paired together with the macramé wall hanger. The material used to construct the product is a cotton rope, it has a metal ring, and the mirror included. Buy it now as it makes a thoughtful gift for anyone. Do you remember the macramé plant hangers in your grandmother’s home? Here we have the handmade natural cotton one you can buy to hang plants in the bathroom or living room. The mini hammock knot keeps the macramé secure and makes a perfect statement anywhere. The plant holder has a dimension of 12 x 12-inches and measures 30-inches in length. 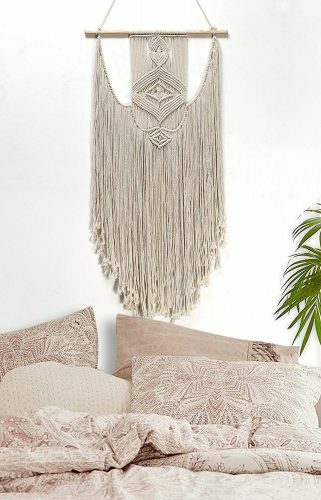 Add some BoHo flair to your apartment or home with this macramé hanging wall décor. The wall hanger adds some rustic art to any open space with the chic geometric pattern. With the handmade cording, the piece creates a stylish draped wall banner to decorate open areas on the wall. Freshen up your living space with the TIMEYARD macramé wall hanging woven with cotton rope. The art piece will add some flamboyance to any office or home. The unique design has a vintage and modern touch with handcrafted knotting. You will make a perfect statement, and it works excellent for covering a couch as well. You can even place it by a window. 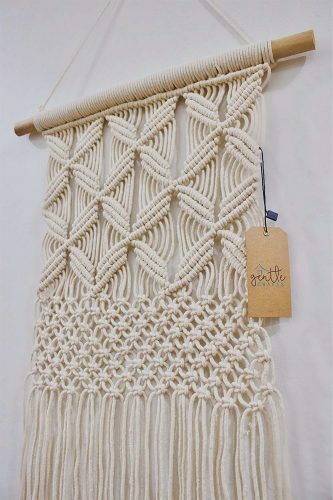 With the next macramé wall hanging from RawyalCrafts, you can add style to any white space. The cotton used to make the macramé is natural and uses a traditional Indian method to construct it. You can buy the product with confidence as they have a 24/7 customer support to answer any questions. 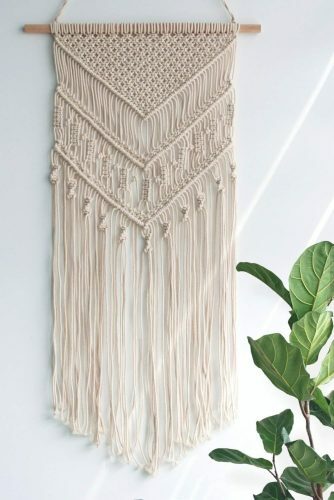 The next macramé wall hanging is elegant and has a unique look. The eco-friendly hanger fits in with modern and traditional homes. The banner has a soft cotton rope construction and even great to use as a decoration at an event or ceremony. There is no added frills and provides a basic and clean look. 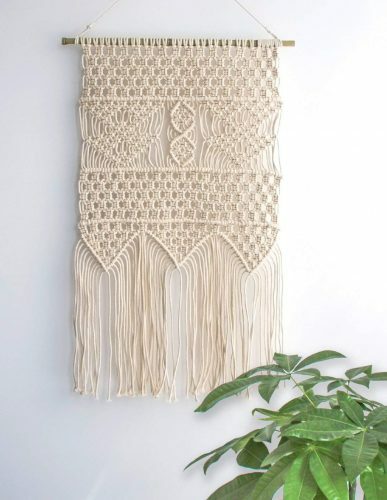 For a sizeable handmade macramé wall hanging, the RISEON tapestry will look great in any apartment, office, or home. The piece even makes for a perfect wedding backdrop, or you can hang it at a window for covering. The tapestry measures 35-inches wide and is 70-inches long. The artworks strung to rope and easily attaches to the wooden rod. 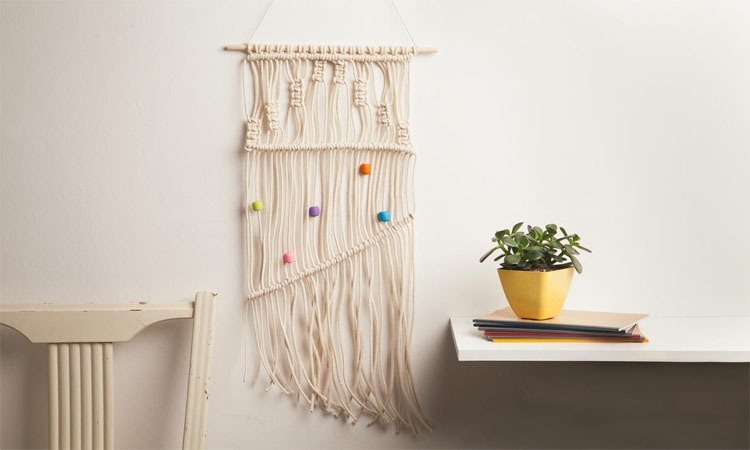 Bring some flair into any living space with the top 10 best macramé wall hangings reviewed here. Each brand offers you the versatility to use in the office, apartment, or home. You can even find one to hang in front of the window or place photos. 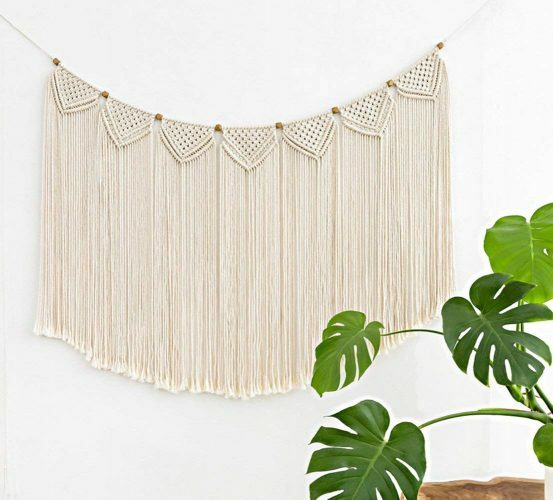 Whether you need to hang plants, want to catch dreams (dream catcher), or need a backdrop for an event the macramé tapestries reviewed can help.